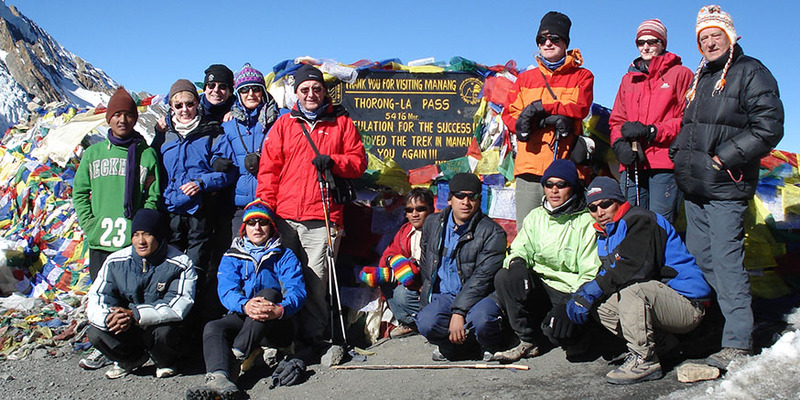 The Annapurna Circuit trek first became accessible to the world of adventure travellers as recently as 1977, when the Nepalese Government derestricted the Manang Valley, which had previously been closed on account of its proximity to the Tibetan border. The 240-km Annapurna circuit takes almost three weeks to complete. It is dubbed the “apple pie” circuit because teahouses line the route offering cold beer and home baking. This trip is a shortened version of the original – it takes two weeks to complete… and we will still get to taste cold beers and apple pies! The name “Annapurna” came after the Mount Annapurna, which is the 10th highest mountain in the world. Annapurna is a series of peaks in the Himalaya, a 55km long Massif who’s highest point, Annapurna I, stands at 8,091m. It is located east of a great gorge cut through the Himalaya by the most famous river, Kali Gandaki and which separates it from the Mount Dhaulagiri. Annapurna is a Sanskrit name which is translated as Goddess of the Harvests. In Hinduism, Annapurna is a goddess of fertility and agriculture. The Region, Annapurna is surrounded by many Himalayan ranges which include the Annapurna range, Dhaulagiri and Machhapuchhre – the famous fish-tail mountain that dominates the skyline above Pokhara. In addition this area possess the Kali Gandaki, the world’s deepest gorge. 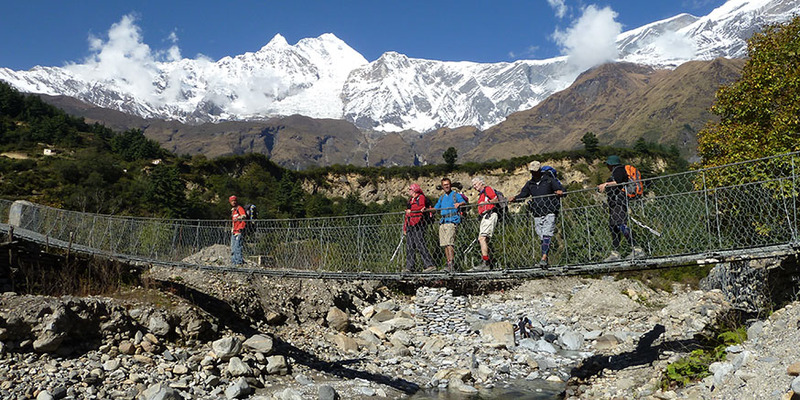 The Annapurna Region is famous for its trekking. In addition to our express route (Jomsom Muktinath), there is also the Annapurna Sanctuary (aka Annapurna Base Camp route) and the Classic Annapurna Circuit route. About two-thirds of the trekkers in Nepal visit the Annapurna region. The area is easily accessible, hotels in the hills are plentiful, and treks here offer good scenery of both high mountains and lowland villages. In this Region, there is a project known as ACAP (Annapurna Conservation Area Project) that was established in 1986 under the guidance of the King Mahendra Trust for Nature Conservation. The project covers the whole Annapurna range, more than 7600km2. In an inventive advance to environmental protection, it was declared a “conservation area” instead of a national park. A large number of people live within the protected region. 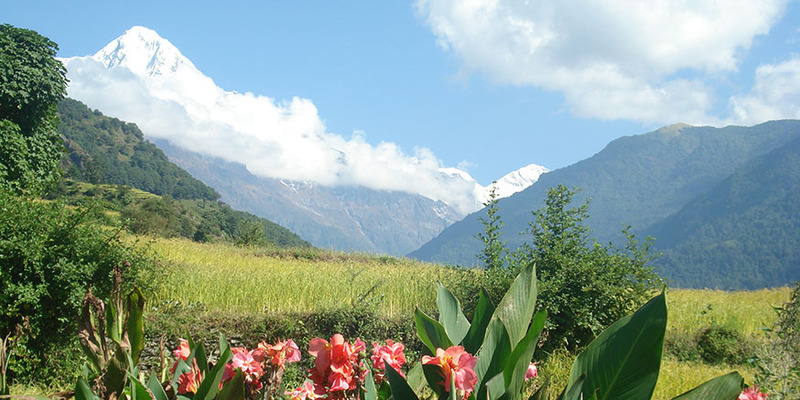 Annapurna Conservation Area offers varieties of flora and fauna form sub-tropical to pine and you will graced by the heart-touching blossoming rhododendron on your way. This region is also the home to copious wildlife like pika, blue sheep, snow leopards, tigers and Himalayan thar. Multiplicity of birds including multi-coloured Impeyans, koklas and blood pheasants, offer you their natural beauty. In this region you will encounter with the Gurungs and Thakali people whose unique culture and religion will surprise you. You will experience how friendly and open hearted these people are, and you can get a taste of their lifestyle by staying in their house and knowing their way of living, culture and tradition. High-altitude trekking in mountainous regions calls for flexibility and adaptability to many conditions. In the wilderness, nature has the final say. For us to survive, we need flexibility and adaptability to circumstances as they unfold. While we endeavour to follow the itinerary below, we may need to change it to suit conditions. The end point will always be returning safely to our families. It is imperative to commit to pre-acclimatization training beforehand to cope with the low oxygen environment that we will be visiting. During the trek, our blood oxygen will be monitored and your guide will advise you how to handle any issues that will inevitably crop up. With this in mind, we will have the best time on a trek that has unparalleled mountain views. A very warm welcome to the Kingdom of Himalayas. Upon your arrival at the Tribhuvan international airport our representative welcomes and transfers you to your hotel in Kathmandu. After some time to get refreshed, in the evening you’ll be met and transferred for a welcome dinner in a typical Nepalese restaurant in the heart of Kathmandu i.e. Utsav or Nepali Chula (Kitchen). Here you will not simply experience the traditional Nepalese dish but will be entertained with Nepalese traditional dance and folk songs. After the dinner, you will be transferred back to your respective hotel. Driving out of the Kathmandu valley gives us some excellent mountain views on the road to Pokhara. This is really pretty good as far as Dumre where we may have a short break depending on the traffic. If not, we will continue to Besi Sahar for our lunch. From Dumre the recently upgraded road heading north to Besi Sahar, is a bit less predictable. Mostly fine, but any monsoon landslides or damage to the surface take longer to get fixed. We’re still driving through wonderful countryside though, and we should reach Besi Sahar (823m) by mid-afternoon, in good time for couple of hours on the trail. We will stop here for lunch and meanwhile our guide will register your trekking permit. After lunch, we continue to Bulbule, driving to Khudi (815m), through mostly Gurung villages we go up the west bank of the Marshyangdi Khola where it is joined by the Khudi Khola, which drains the east of Lamjung Himal. From Khudi we commence our trek. Today we aim for Bulbule (850m) where there are few local lodges. From Bulbule, the valley changes character, narrowing to a gorge. Crossing to Bulbule, we pass the first of the waterfalls for which the Marshyangdi is famous. On through Terante we reach Ngadi (915m), where we will generally stop for short break perhaps tea/coffee. Crossing the Ngadi Khola we then climb a long, and sometimes hot, hill through Lampata we reach Bahundanda (1,310m). Brahmin Hill, our lodge, is on a saddle ridge with excellent views to the north and of the surrounding hillside Gurung settlement. Carefully descend on the slippery rocks to another stream with a traditional cantilevered bridge. The trail here is carved out of the rock wall itself. Through Khanegaun, we continue to Shyange (1,135m) and stop here for lunch. After this, we cross a large suspension bridge over the Marshyangdi gorge, and continue to Jagat. Before reaching Jagat there is a curved road on a huge rock cliff, and sometime we may cross with mules (main transportation of public supplies of the area). It is most important to stand with backs to the wall all the time when you cross with these mules to secure yourself. There has been accidents where trekkers were pushed over by mules and fallen a long way down to the Marshyangdi River. Never stand and wait on the down hillside. Jagat is an old customs post on the Tibetan trade route still inhabited mostly by Bho Tiya (Nepali term for Tibetans) traders. Our lodge accommodation is the best available at Jagat (1,345m). After breakfast, we start our trek walking via Chamje (1,390m), just beyond Jagat. We notice that the vegetation is becoming less tropical and that the people seem more ‘Buddhist’, though with the Nepali custom of blending their cultures, most here are actually Hindus. After Chamje, there is a noticeable change to both landscape and people. From here, most of the houses are made of stone, instead of the mud rendered lattice. Entering a broad valley, we reach Tal (1,665m) for our lunch stop. We have entered Manang District. Continuing up the east bank on another rock cut path, we cross to Dharapani(1,885m) our lodge stop, a fine village at the end of the confluence of the Marshyangdi and Dudh Khola which leads up to the Larkya Pass to the north of Manaslu. After the neighbouring village of Thonje, where we register our trekking permit again, we continue up the west bank taking the path to Bagarchap (2,105m). Here the Tibetan-style flat roofs are a clear indication of the reduction in rainfall to the area as we enter the shadow of the Annapurna range. Going past excellent views of the east face of Lamjung Himal, we get to Latamarang (2,355m) for lunch. We then take the easy path to the district administrative centre of Chame (2,615m), our lodge for the night. Today’s highlight is the Paungda Danda rock face, an interesting and large rock slab. Pisang peak (6,191m) looms over Pisang village. We follow up the narrow forested valley to the old Khampa settlement at Bhratang (2,845m), our lunch stop, once a centre for the fierce Tibetan warrior’s resistance to Chinese occupation. We cross over and begin to climb up through the forest away from the river. The silence itself is dramatic as we round this pine forested ridge. We continue down to Pisang (3,135m) our lodge stop. The Tibetan feel of the village is unmistakable, fine tapering walled houses and long lines of prayer wheels and mane walls. There is an excellent short detour for those with spare energy, up Pisang gompa (3,230m) across on the north bank, with amazing views back of the huge north face of Annapurna II. This is the Nyesyang region of Manang – the people are well travelled traders. There is a choice of two routes today: a shorter direct one the along the south bank valley floor via Hongde airstrip, or a more interesting, but fairly longer route higher on the north bank through the village of Gharyu and Ngawal. This could take three hours longer but offers such magnificent views of the mountains to the south. Both meet at Braga cliff side village (3,450m), below it is a 900 year old gompa of the Kangupa sect of Buddhism, sadly used little now. The main village of Manang (3,500m), our lodge stop for the next two nights, is nearby. Manang is a fascinating Buddhist village with the same name as the area. It’s ideal for our essential acclimatization rest day before taking on the Thorong-La. There are excellent side trips such as the short climb to the Cliffside Bod-zo gompa where the lama performs a blessing ceremony to protect us on our journey. Everyone should aim to manage some ascent to further our acclimatization, if only to this little monastery. The more energetic may wish to visit the high village of Khangsar on the opposite bank. A good day’s round trip and well worth the effort. As you get higher in the Himalayas, it’s important to be aware of the effects of altitude sickness. It is essential for proper acclimatization to make stops between Manang and Thorong Phedi. As we leave Manang, the path gradually ascends higher up the valley; however, at this altitude, you will definitely feel the effects of the higher elevation. We will overnight at the village of Yak Kharka. If you still have some energy, there are several additional shorter hikes you can take around the village in the afternoon. Thorong Phedi literally means the bottom of the Thorong pass. There is a lodge at Thorong high camp. If we are lucky enough to get accommodation for the night in this lodge, which offers the most amazing views, it would be less effort the following day. It is a truly spectacular setting perched in a craggy arena between the peaks. This if the last possible lodges before the pass, and it is not recommended to sleep higher at this stage anyway. We may have to spend the night at Thorong Phedi at some stage. However, we are here well in time for lunch and a decision will be made while we rest. The most important thing here is to keep drinking to prevent dehydration. Stay warm all the time and if you feel any altitude sickness symptoms appearing, you must inform your guide. This is the big challenging day. Once over the pass, the rest of the trek is plain sailing in comparison. We need an early start. Steady uphill all the way as we wind our way step by step. We deliberately set a slow steady, sustainable pace, taking short rests to watch the unfolding views. The immediate ground is dry and bare as even the heather shrubs and grasses thin out. It is dramatic enough though, almost lunar especially in the early light. One shallow gully opens to the next, and we reach several false crests which tease us into thinking we have reached the top. The real Thorong La (5,416m) finally comes into sight, marked by a large cairn and decked with coloured prayer flags. Its takes 5-6 hours from Thorong Phedi, and 4-5 hours from Thorong high camp, to reach. In spring particularly there could well be some snow on the ground, but the path should be well trodden. Bear in mind that this is very definitely a trek, we will not attempt the pass in anything approaching mountaineering conditions. The rewards for our hard walking are the spectacular views of this dramatic transition between the Manang valley behind and the Kali Gandaki River spread out in front, with the massive from of mighty Dhaulagiri on the far side visible from just beyond the pass. The sculpted ice peak of Thorontse is to the north; Khatung Kang is to the south. We take a good long rest on the top, and eat the packed lunches we brought up from the lodge. The decent is gradual at first, quite steep for a while and then evens out again. There are great views all the way, and it takes 3-4 hours down to Muktinath (3,800m), our much welcomed night stop. Muktinath is a remarkable place, sacred to both Hindus and Buddhists. Legends say that Brahma, the creator, made an offering here, lighting fire on water, which can be seen in the small Buddhist gompa below the Hindu mandir (temple). Hindus believe that bathing in the 108 boar’s head waterspouts brings salvation after death, so pilgrims comes here all the way from India. There is a mutual coexistence between the two religions so unique to Nepal. Buddha is said to be the 8th incarnation of the Hindu god Vishnu, and Buddhists take the image of Vishnu to be that of the Bodhisattva Avalokiteshwara – of whom the Dalai Lama is said to be a reincarnation. Layer upon layer of deeply felt tradition reinterpreted through centuries of devotion. Padmasambhava, the great sage revered for bringing Buddhism to Tibet in the 8th century, is said to have meditated right here, but whether this gave birth to the legends or merely continued them is difficult to say. Then the 84 siddhas (great magicians) left their pilgrim staffs here on their way to Tibet – they are believed to have grown into the original beautiful poplars that surround the site. Today, we follow the trail down to the Eklebhatti and then follow the Kaligandaki River to Jomsom. Jomsom is a large town with many facilities. It is also the headquarters and official town for the whole of Mustang district where all the government offices are available for the local people. We stay in a lodge tonight before our departure tomorrow. After breakfast, we will take a five hour drive to Pokhara stopping with plenty of Nepali countryside views. A well awaited for hot shower awaits us at the hotel. As time permits, we will do a short tour of the city. This morning we take a drive to Sarankot Hill for the sunrise and then we fly back to Kathmandu. We will be met at the airport and transferred to our hotel. It’s time to fully relax, and remember, tonight we will be hosting a fantastic celebration dinner in the finest restaurant in Thamel to celebrate the successful completion of your Himalayan trek. The rest of the day is free for last minute souvenirs and gifts shopping, and general exploration of the city. Today we will be transferred to the airport for our departure flight or you may opt to stay extra nights in Kathmandu. Three night hotel accommodation in Kathmandu in 3 star hotel with all rooms having private facilities. Breakfast is included. Accommodation is on a twin share basis but single rooms are usually available at an additional cost. Please inform us as early as possible if you wish to have a single room. One night hotel accommodation in Pokhara in one of the finest hotel at lakeside Pokhara at the end of the trek, breakfast is included. Accommodation is on a twin share basis. Trekking permits, National park entry fees & all government taxes. Domestic flight ticket Pokhara to Kathmandu. All pickup and drop transportation from airport to airport both domestic & international airports. Transportation Kathmandu to Besi Sahar / Khudi by private vehicle. Transportation from Jomsom-Pokhara by private vehicle. All ground transportation in Pokhara. All lodging during the trekking period. Three meals a day – breakfast / lunch / dinner & hot drinks. A local Sherpa guide and an assistant Western guide. Appropriate number of porters (one porter between two trekkers). One day sightseeing tour in and around KTM including entrance fees. Post trip cultural celebration meal either at Nepali Chula restaurant or similar with all the staff. A comprehensive First Aid Kit only for crews. All trekkers are requested to bring their own personal First Aid Kit with sufficient medication supplies for the trip. A regular cell phone with local SIM Card and charger cable will be provided to the team during the trip. International airfares, transfers en-route and excess baggage. Domestic flight from Jomsom to Pokhara, if decided to fly (about USD$150pp). Main meals (lunch & dinner) in Kathmandu and Pokhara apart from celebration meal in Kathmandu. Excess baggage above 15kg will be charged at USD15 per kg for domestic flight. Additional accommodation in Kathmandu / Pokhara for early arrival, late departure or early return from mountain (due to any reason) than the scheduled itinerary.